Still low bond yields point to soft medium term returns from bonds, but it’s hard to get too bearish on bonds in a world of too much saving and spare capacity. Central banks won’t ratify a bond crash like in 1994, by raising interest rates aggressively. US economic data was mostly good consistent with the view that growth has picked up after the March quarter slowdown, albeit not as strongly as occurred last year. Some softness include housing starts fell in May but permits to build new homes and NAHB home builder's conditions index rose solidly indicating housing recovery. Jobless claims fell and US leading index rose. Core CPI inflation weaker than expected, 1.7% (target is 2%). The Fed remains on track to hike interest later this year, but it’s looking more gradual. Fed revised down its interest rate expectations (the so-called dot plot) reinforcing that rate hikes will be gradual. Base case remains that the first hike will be in September – but the risks are that a combination of slower growth, Greek related turmoil or a stronger US dollar could push this out to December. In the Eurozone, bank take up of cheap ECB Targeted Long Term Refinancing Operations (TLTRO) money was strong for the second quarter in a row adding to confidence that bank lending will continue to improve. Focus will remain on whether there is a resolution on Greece. Meanwhile, expect the noise around Greece to have weighed on the Markit manufacturing and services conditions PMIs (Tuesday) but money supply and bank lending growth (Friday) are expected to show further improvement. The Greek standoff continues. The lack of progress in negotiations and the negative rhetoric from the Greek Government is clearly worrying for investors and the risk of no deal, setting Greece on a path of default and exit from the Euro, has clearly gone up. While the Greek mess is unnerving and may go on for a while yet, it’s unlikely to drive a return to the mini bear market in shares we saw back in 2011 at the height of the Eurozone crisis. It is of my opinion that Greece will make a last ditch effort and soften stance not to default - it is more damaging to leave than to remain within the European Union. Chinese shares have had another sharp pull back with the Shanghai composite having had a 13% fall from its June 12 high. After rising 140% over 12 months and around 50% year to date such volatility is to be expected as it has risen a bit too far too fast. The easy gains are probably over and a period of correction would be healthy. However, it’s worth reiterating that the Shanghai composite index on an historic price-earnings of 21 times is still below its long term average (~28) and should benefit as further monetary easing comes through. stabilisation in Chinese property market indicates that a key source of risk to the Chinese economy is now receding. The June MNI survey of business confidence also rose. In Japan, the Bank of Japan (BoJ) left monetary policy unchanged but this was as expected. Pressure for more easing remains though, and despite BoJ Governor Kuroda's confusing comments on the value of the yen, it’s likely that it will see further falls ahead. In Japan, the Markit manufacturing conditions PMI (Tuesday) and a range of economic data to be released Friday will be watched for confirmation that the Japanese economic recovery is on track. In terms of the latter expect to see jobs data remaining strong and a rebound in household spending growth. Core inflation is expected to have remained only just above zero though highlighting why the Bank of Japan is still likely to be forced to undertake more monetary easing. Over in Malaysia, the stock market continues to be plummeted by foreign funds selling. Two days ago, it was believed that Ringgit will hit RM3.80 to the US Dollar. 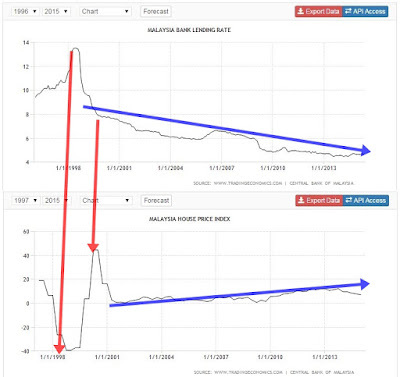 It is very likely that Bank Negara has intervened to push up the Ringgit. Data compiled by Bloomberg shows 3.7650 to a dollar as of 10.26am in Kuala Lumpur. The Sing Dollar is at RM2.80 now, the highest ever in history. Malaysia’s ringgit dropped the most in Asia on speculation Fitch Ratings will downgrade the country (from A- to B+) as the US moves toward raising interest rates later this year. To defend the Ringgit we can either sell foreign reserves or increase interest rates (2 of the most conventional ways). BNM will not do the latter because fears of housing collapse. Here's the correlation between lending rate (which is closely tied to interest rate) vs housing price index. The saying goes, Interest rates can’t stay low forever otherwise inflation will go out of control. Sounds familiar Malaysians? Other news obtained by Icap, manufacturing sales value fell by 0.6%, year-on-year. Big declines in sales value of petroleum related products and this is likely to have an impact on the manufacturing sales in the coming months ahead. Overall there is no good news in Malaysia - I have said many times before, our market has no catalyst at all. The honeymoon period is over.